GPU technology improves Citrix virtual desktops and applications, but to truly deliver an immersive user experience that scales, organizations need to manage the complete GPU deployment lifecycle – from designing the infrastructure, to managing and optimizing a production environment, to responding to user issues dynamically, in real-time. 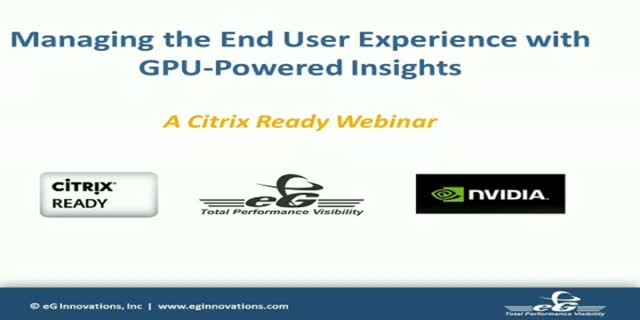 eG Innovations in partnership with NVIDIA is delivering comprehensive monitoring capabilities that enable IT to better manage all aspects of the user experience, tapping into new GPU-sourced insights that aid in design right-sizing, proactive infrastructure optimization and help desk issue remediation. This new joint solution integrates eG Enterprise with NVIDIA GRID software to provide actionable insights through host-level, guest-level, and application-level analytics. Attend this webinar to learn how to deliver complete lifecycle management of the end user experience for GPU-powered applications and desktops. Performance management of Citrix technologies has always been a challenge. Determining if user complaints of Citrix logon slowness, session disconnects, screen freezes, etc. are caused by the Citrix stack or by one of the supporting tiers has often been a time consuming and knowledge intensive process. Virtualization of Citrix applications has only added to the challenge. Join this webinar "A Deep Dive Into Comprehensive Citrix & VDI Monitoring with eG Enterprise" to learn how eG Innovations, one of the earliest Citrix-focused monitoring software vendors, has been adapting its eG Enterprise solution to keep pace with Citrix technology evolution. – The discussion will also cover new capabilities in the latest eG Enterprise 6.1 release. 93% of respondents to the 2016 Citrix Performance Survey see Citrix XenApp and XenDesktop as two of the most performance sensitive technologies in use in enterprise networks today. Slow logins, frequent session disconnects and slow screen refreshes are just some of common complaints that Citrix administrators have to deal with these days. Furthermore, often when a user complains that their desktop is slow or an application is slow to launch, the issue is not in the Citrix tiers – but instead in the network, the virtualization platform, or storage tiers. End-to-end visibility, root-cause diagnosis and proactive alerting are therefore key requirements for Citrix administrators. Join us for this webinar, ‘Choosing a Citrix Monitoring Strategy: Key Capabilities and Pitfalls to Avoid‘, where Citrix Certified Expert Rob Beekmans, Senior Consultant with PQR, a Citrix Platinum Advisor, and Srinivas Ramanathan, CEO of eG Innovations, will discuss the key requirements of effective Citrix performance monitoring as well as common pitfalls you need to avoid. Today, poor user experience is a business problem, not just an IT problem. If the performance of your web applications is consistently poor, your users will take their business to a competitor. Traditionally, IT managers have been “data center” focused, looking at system resource metrics rather than the end user experience. Even when performance is considered at the application level, the metrics are based on individual elements (SQL response time, application heap usage, etc.) and are not focused on what is really happening from the users’ perspective. The data center-centric approach is insufficient for effective application performance management. Performance could be perfectly fine on the server-side, but be horrible when viewed from the end user perspective. Watch this webinar to learn how to monitor, diagnose and report on the real user experience for your business-critical web applications. Citrix XenApp and XenDesktop are among the most performance-critical technologies being used in enterprise networks today. Just a small glitch - anywhere in your infrastructure - can result in a poor user experience. The growing number of tiers in the Citrix stack and the increased use of virtualization technologies and cloud-based services all make Citrix performance management even more challenging. In addition, we will address how a comprehensive performance monitoring solution goes well beyond routine troubleshooting and problem isolation by helping to optimize and right-size the infrastructure as well as deliver maximum value for the organization's IT investment. Application and desktop virtualization offer so much promise for smart growth, flexibility and cost savings in healthcare IT today, but along with this potential comes substantial risk. Poor performance and a bad end-user experience can degrade productivity, inflate management costs and, worst of all, negatively impact quality of care and patient satisfaction. At the same time, the healthcare IT infrastructure has increased in both scale and complexity. Hence, administrators struggle to determine when a slowdown happens, what is the cause: Citrix? VMware? Storage? Windows? A Specific Application? Join us for this webinar where, along with HiMSS, Wendy Howard, Infrastructure Engineer with St. Charles Healthcare and Bala Vaidhinathan, CTO with eG Innovations, will discuss how implementing unified performance management powered a transformation from difficult, slow and reactive performance troubleshooting to well-planned, strategic rollouts, proactive maintenance, simple executive reporting and rapid caregiver support. The goal of Virtual Desktop Infrastructure (VDI) is to lower the operational costs of supporting an organization’s desktops and laptops. A VDI project should make it easier for IT to support users, keep the organization safe from viruses and better protect its data assets. The key to a successful VDI project is user adoption. But while many organizations consider using an All-Flash Array (AFA) to deliver the performance that will lead to user adoption, the problem is AFAs drive up the cost per desktop, increase the vulnerability of the architecture and encourage additional storage silos. Join Storage Switzerland and Cloudistics for an informative webinar that will provide an alternative approach that meets user’s performance expectations while leveraging existing – and often already paid for – storage hardware and does not introduce new silos of storage. Citrix application infrastructures are very performance sensitive. A small problem anywhere in your infrastructure can quickly lead to frustrated users complaining to the help desk that “Citrix is slow” or “Citrix is not working”. You then have to spend hours finding out where the real problem lies before you can resolve it and restore a positive user experience. Is it really a Citrix issue, or is the issue actually originating somewhere else in the infrastructure – i.e., the network, application, virtual platform, storage, etc.? In this webinar, Bala Vaidhinathan, CTO of eG Innovations, will discuss how you can extend Microsoft System Center Operations Manager (SCOM) to monitor and manage Citrix infrastructures end to end, so when a user complains that Citrix is slow, you can pinpoint exactly where the cause of the problem lies — in just one click. Transform MS SCOM into an End-to-End Monitoring Powerhouse w/ The "One Monitor"
To extend Microsoft SCOM for heterogeneous environments that include Citrix, SAP, Siebel, VMware, Oracle, Sybase, DB2, Java, etc., multiple management packs are often deployed - one for each non-Microsoft platform. But the lack of integration between management packs leads to long problem identification and diagnosis cycles, resulting in poor user experience and loss in productivity. The eG Enterprise Microsoft SCOM Management Pack allows you to centrally monitor performance both across your entire infrastructure and deep throughout each individual tier, automatically identifying the root causes of performance issues, improving service delivery, saving time and increasing IT value. In this live solution tour, you will learn how to escape siloed monitoring and leverage your SCOM environment to gain real-time insight into every factor that affects your end users’ experience, across your entire infrastructure. Virtual desktops are being widely adopted as a cost-effective way of providing users access to enterprise applications. Performance of these desktops and the scalability of virtual desktop deployments are a key to the success of these IT initiatives.